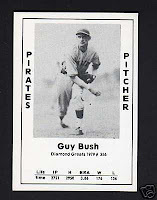 In spring 1935, Pirates right-handed hurler Guy Bush was happy to see aging, broken-down Babe Ruth lurching through the National League with the Boston Braves. "I had been with the Chicago Cubs for a dozen years and had pitched to Babe only once before in the World Series," said Bush. "I was still so strong I didn't believe anyone could hit anything off me." One May afternoon in the sixth inning at Forbes Field in Pittsburgh, Bush was summoned to relieve and pitch to Ruth. He surrendered a home run. "I got tagged on a high inside fastball," said Bush. "He just pulled it down the right-field line. No further than one of our .200 hitters would have popped it." Over the next two innings, the Babe's cheap homer nagged at Bush. The more he thought about it, the angrier he got. "Coming out of the dugout in the ninth, I told our catcher, Tommy Padden,'Tommy, this great Babe Ruth is coming up again and I'm going to throw a fastball right by that jackass'" Bush said. "I meant to throw three fastballs by him and watch the crowd laugh as he swung." Bush's first fastball was slightly outside. "He looked it over like it was a softball," said Bush. "He looked me right in the eye. And I nodded to him and threw another in the same spot." Ruth smacked it over the third deck. "I never saw a ball hit so far," said Bush. 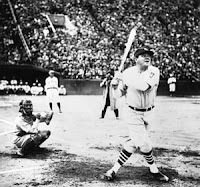 The Babe slowly circled the bases for the 714th and last time. "He just smiled nicely to me as he rounded third," said Bush. "I tipped my hat."